A new mining act signed into law by President Uhuru Kenyatta could see Kenya’s nascent mining industry finally come into its own. Oil companies, like UK’s Tullow Oil, have been prospecting in Kenya for a few years now, and they are expected to start production by 2021. Due to a mining law passed late 1940 combined with geological data that was 32 years older than that, Kenya missed out on the mineral exploration boom that benefited it’s neighbors Tanzania and Uganda. The Kenyan ministry for mining was created about three years ago and the sector’s size is bolstered by the fact it includes production of cement and soda ash. India’s Tata Chemicals partly owns Kenya’s largest manufacturer of soda ash the Magadi soda company. 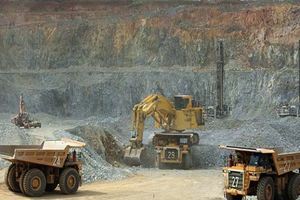 Dan Kazungu, the current mining minister, has reportedly envisioned a strategy that he hopes will see up to 20 more operators such as Base Resources in the coming 15 years. Government revenues from mining and mineral operations were just Ks1.65bn ($16.5m) in the last financial year and Mr Kazungu expects these to have more than doubled by June, the end of the financial year, with a goal of 10 per cent of GDP by 2030 — a figure likely to be well over $7bn. This is achievable he says, by attracting foreign investments and registering the tens of thousands of Kenya’s informal miners, developing a mining services industry and expanding the small gemstone industry.